With the replacement All-Spark cube complete, Starscream has his enemies (mostly Autobots) collected for the next phase of his experiment. Although he does wonder if he’s coming under the same madness he saw in Megatron and Optimus he brushes it off because he’s actually achieving the return of the All-Spark. Meanwhile, Arcee (having snuck aboard the Decepticon craft back on Mars) meets up with a small band of Autobots still on Cybertron and sets up a rescue mission for their captured comrades. When they arrive, they find those comrades (and at least one whiny Decepticon) chained to the new cube, ready for the experiment! What they got right: We get movie-tised versions of the figures repainted for store exclusive repaints (or “redeco” if you prefer) of pre-movie figures in the movie toyline. 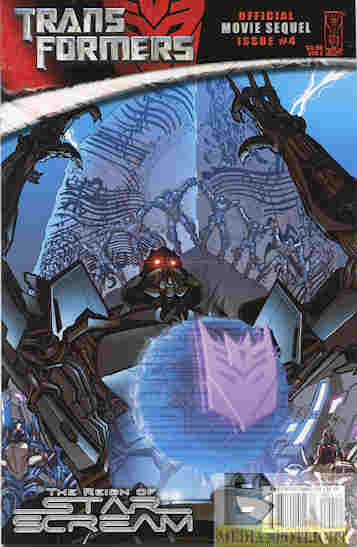 (For example, Clocker comes from Transformers Cybertron, and happens to be one of my favorite molds of the series. Here he gets a Bay-style makeover and as movie designs go it isn’t too bad.) We also see Starscream slowly falling into the same obsession as Megatron and only barely realizing it. What they got wrong: Even Arcee notes that she was out one astrosecond and alive the next to hop on the Decepticon ship’s landing gear. There’s no explanation, although at least this is good because she is in the sequel, albeit replacing her feet with wheels and making her part of a Combiner, which the comics had to explain later on. Maybe still show her injured or faking her death or something. Recommendation: It’s still a better Movieverse story than most of the movies. It’s worth looking into. Posted by ShadowWing Tronix on December 20, 2018 in Movie Spotlight, Yesterday's Comics and tagged All-Spark, Arcee, Clocker, IDW Publishing, Starscream, Transformers (film series).